Our two parish churches now have live webcam feeds. When entering church you will see the following notice informing of streaming. The live stream is a wonderful opportunity for our parish to enable, the sick, lonely, and housebound to pray together. Many local parishes have been successfully live streaming for quite some time now. There are elderly parishioners who are amazed that whilst they are no longer able to get to church, modern technology can bring their very own parish to them! It is hard to imagine what great comfort this service is to so many of our parish, it is technology being used to spread the Word and love of God. This information sheet has been put together with advice from MCM media, the Diocesan Education Service and local parishes. The most frequently asked questions have been answered for you. Live streaming refers to online media simultaneously broadcast in real time to the viewer. It is often simply referred to as streaming. It means you can watch an event via the internet without actually being there. Why do we need Live Streaming in our Parish? Live streaming is a way for the people to join in with parish mass, from their homes, hospital or care facilities. With so many parishioners unable to physically join us in church for mass it is a way of reaching out. Loneliness is a real issue in our modern world and live streaming allows people to pray together. Elderly people have been able to take part in the funeral mass of loved ones from their care homes. House bound parishioners are able to celebrate mass with their parish before receiving communion from an extraordinary minister. Many parishes in our Diocese have live streamed for a number of years now, all our parishioners can benefit. Why do people need to join together to pray, can’t people pray alone? There are many different ways to pray. Live streaming helps us to pray in a way promoted by Jesus himself. Can you live stream without my permission if I am in the congregation? Church is a place open to the public, everyone is welcome through the door. Live streaming can take place information notices must be publicly displayed. No recordings are made, recording would require permission. Do I need to worry about safeguarding? Safety and well-being of all, especially children and the vulnerable, is the highest priority. Any media involving children from school during the school day always required parental consent. No school events will be live streamed without parental consent. 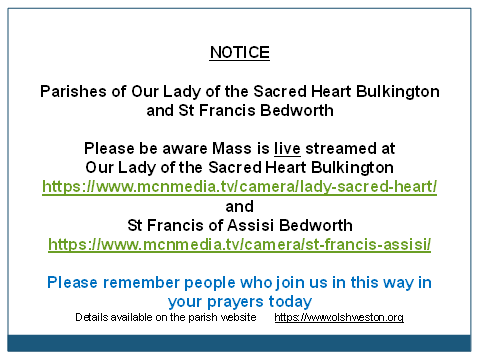 Parents and carers can bring their children to parish events which are live streamed. Risk assessment of children and vulnerable people being in church and on live stream is extremely low risk. No child or adult is ever identified by name through the stream. Identity is protected as we would with use of photos displayed in the parish church or school or on our website or school social media. I don’t want to be live streamed, what should I do? Choose a seat away from the front of the church and receive communion from a side aisle at St Francis or the side chapel in Our Lady of the Sacred Heart church. You may have another question which is not answered here, please do feel free to ask!